The team from Redmond continues to press ahead with its Microsoft Garage projects for Android, which often result in pretty good apps, lock screens and the like. Conquering Android from within one step at a time means you have to offer a nice note-taking app, too, right? Well, Microsoft is now bringing us Parchi (pur-chih) - a quick notes and lists application that strives for simplicity and speed. It is not meant for long brainstorming sessions over your next magnum opus, but rather the idea is to use it as if you would scribble something on the last page of your notebook, or the corner of the page for a quick reminder later. 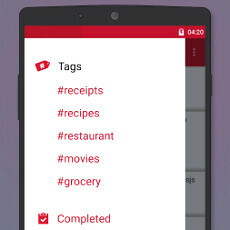 Parchi is hashtag based, so it's modern - you can add note inline, or use the #tag interface. Notes can be taken directly from the lockscreen, pinned, removed, or added back. The notes can consist of text, lists or pictures, and you can color-code them, or set reminders. There is quick search and a share option, group management of notes, and smart context actions for URLs, phones or emails. In addition, everything you create with Parchi can be backed up and restored later when needed. Take it for a spin from the link below, and tell us what you think about Microsoft's latest Android entry. Interesting that Microsoft is developing quite a number of apps for Android. Also most of Microsoft's Android apps follow Material Design guidelines And most of their iOS apps follow Apple's guidelines Good on Microsoft for doing that! That's just show Microsoft give respects to the platforms and their customers. If only Google would give me some google apps on my Lumia. Been using Google Keep since its release.